Less is often more in an office environment. So, looking like you're headed to a nightclub when you walk into work is a big no-no. Appearing professional and polished is the way to go but make sure you review your employer's dress code and jewelry policy. As shocking as it may seem, some companies have a no jewelry policy enforced. If your goal is to climb the corporate ladder, leave the shoulder duster earrings and five inch stiletto heels for the weekend. Wearing a hand full of midi rings or wrist loads of clanking bracelets are fabulously fun but unless you work for a fashion designer or a hip PR firm these pieces will not be considered office appropriate. If you want to wear rings to the office, try wearing a chic stack on one finger. Bold cocktail rings are cool but probably better to wear after five o'clock. It is usually acceptable to wear your wedding and engagement rings with another ring on your opposite hand. Jewelry at the office should not be heard! You may be the master of amazingly chic arm parties however wearing them to work is not a good idea; you should be seen not heard! If you want to wear a bracelet, go for a lone statement making cuff bracelet or wear a delicate bangle bracelet or two. Wearing a watch and a bangle is acceptable as long as you are not distracting your co-workers with jingle jangle noises all day. Necklaces at work are admissible as long as they are not a danger to your job or cause distraction. Simple chain necklaces with small pendants are most suitable. Wearing bold neon colors or highly bedazzled pieces to a highly conservative office would not be wise. Pearls are a classic look that often work well in an office environment. We suggest that if you do wear a statement necklace to make sure that it is the focal point of your outfit. If you choose this look take the size and color into consideration. Earrings are perfectly fine to wear to work so long as they are suitable. A simple stud is the easiest choice. Some women consider stud earrings to be boring, but there are so many style choices available these days that you are sure to find an office appropriate option. When wearing hoop earrings to work you should consider the size. Leave the giant bamboo name plate earrings at home. 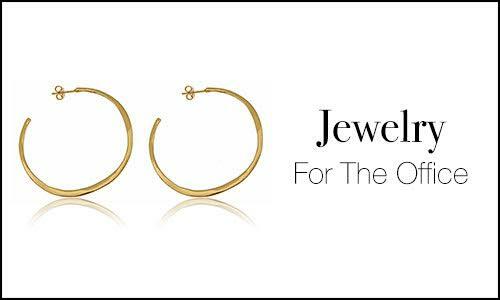 Chic classic hoop earrings in solid metals or medium sized diamond hoops are the best options. Overall when working you want to project a positive work image. Looking polished, professional, and confident will perpetuate your success.